Have your guests feeling all warm inside with this color palette of sunshine, indigo and pops of green. These flowers by Lush Couture Floral are the perfect understated elegance for your reception. With blushing blooms of chartreuse, ivory and curly willows they are sure to command the center of attention. Pair it with this five-tier confection from Romano’s Bakery. With a touch of fun and sophistication, this amazing wedding cake is perfect for your sunshine soiree. Your maids will look sweet and sassy in this classic After Six dress available at Bridal Boutique and Patsy’s Bridal. Pair it with these adorable pale yellow flats from Valentino. And finish off the look with these perfect drop earrings by Kendra Scott available at Patsy’s Bridal and Bella Bridesmaid. Don’t forget to set the tone for this playful party by using these adorable invitations from Art by Ellie. 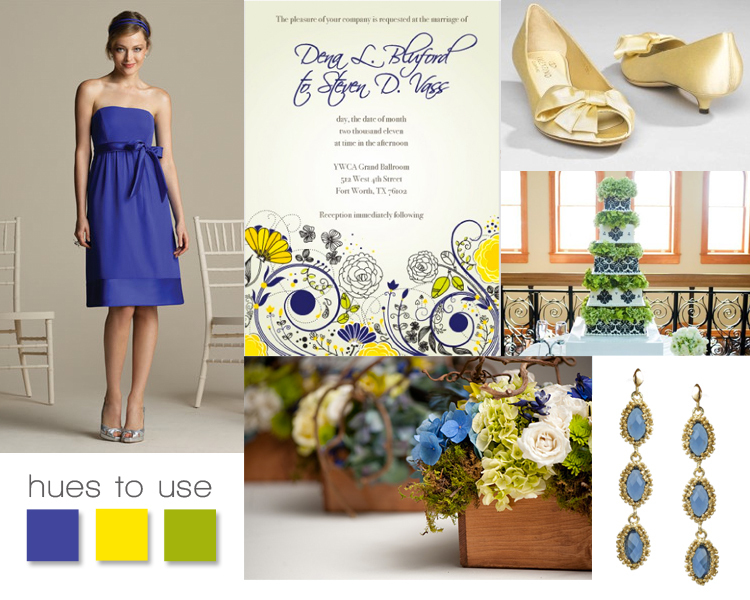 With this color palette of yellow, indigo and green you can’t go wrong! Cheers! « Previous Post: Announce Your Wedding In Brides of North Texas!